The start of the season looked so promising for the Titans after their opening day win over the Bucs, but since that day there hasn’t been much good to the 2015 season. That trend continued on Sunday, as the Miami Dolphins came to Nashville and crushed the Titans 38-10 in what was the debut for new Miami coach Dan Campbell. Campbell took over for Joe Philbin, who was fired after he and the Fins lost three straight after opening the season with a win over the Redskins. Miami got off to a fast start, running over the Titans right away with a touchdown on a reverse by Jarvis Laundry to quickly make it a 7-0 Miami lead. The Dolphins opened with their first TD in the first quarter this season with an old play in the Statue of Liberty. Campbell won a replay review, challenging a Marcus Mariota incompletion ruled a fumble on review. Things didn’t get much better from there for Tennessee. The Titans couldn’t stop Cameron Wake, as he got his first four sacks this season and also forced two fumbles – all in the first half against a not so ready Titans offensive line. Not that the result was in question, but Reshad Jones made a twisting leap into the end zone while finishing off a 30-yard interception return for a touchdown that made it 24-3 early in the third quarter to send a lot of the Titans faithful for the exits. 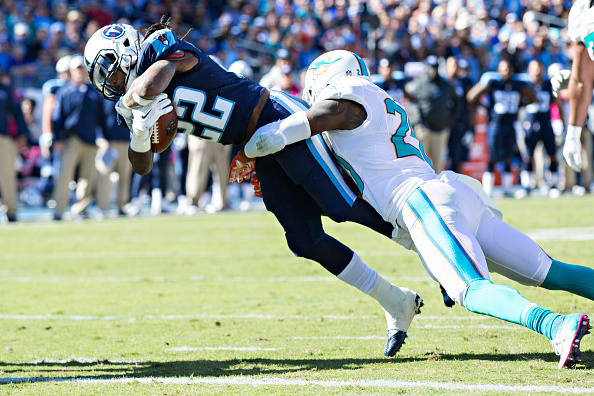 The Titans (1-4) lost their fourth straight, and their home skid is up to eight dating to last season. Fans booed heavily before heading to the exits, and coach Ken Whisenhunt dropped to 3-18 since taking over last season. Mariota was 21-for-33 for 219 yards, was sacked five times and also picked off twice. Zach Mettenberger got some cleanup duty, but it didn’t matter much. The Dolphins outgained Tennessee 434-299.